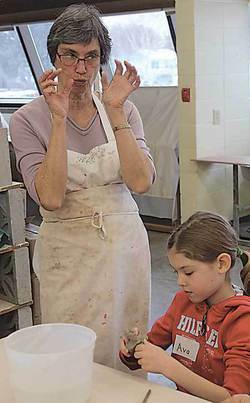 during the Wetaskiwin Allied Arts and Crafts Centre’s kids pottery class Jan. 19 in the city. For the next four weeks, a group of kids will be learning first-hand from the experts on how to create their own works of art through pottery. Every Saturday from Jan. 20 until the middle of February, the Wetaskiwin Allied Arts and Crafts Centre is hosting a kids’ pottery class, where the young students learn the basics about taking ball of clay and turning it into their own creations to take home. During the first week, the students were taught how to make their own pinch pot. By the third week, the students are able to try their hand at using the pottery wheel. There were six students registered in the winter kids’ pottery class. Instructor Judy Bortnik said the class before Christmas normally has higher registration numbers with up to 12 students, and more on a waiting list, but the class after Christmas time is slower with half the registered students.